Lyon locker parts and locker accessories such as sloping hoods, closed bases, and top and front fillers are the final pieces needed to complete your locker project. Add extra security to your lockers with combination or keyed Lyon locker locks. We have locker shelves which install easy with our locker hardware. Lyon highly recommends that lockers be either floor or wall anchored. Anchor feet and angles are available for either lockers with or without legs. You can add locker accessories like front and top fillers to your locker run to help the lockers fit better between walls and close up any extra gaps. Closed front and end base can quickly convert existing lockers to have a clean and finished look. You can add locker number plates so users can easily identify their Lyon lockers. Order locker supplies such as hooks for quick and easy replacement. Do you have some lockers that could use paint? Lyon touch up spray paint is the best way to give your lockers a refresh. 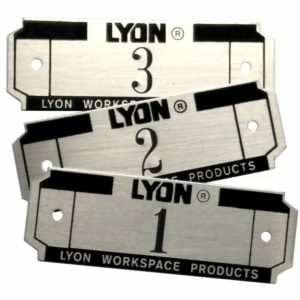 We keep most Lyon locker accessories in stock and can ship quickly. Configuring lockers and locker accessories can be tricky, but Lyon is here to help! Our sales representatives are ready to assist you with a locker quote. Provide us with as much information as you can about your project and layouts if available. Then a Lyon representative will reach out to you quickly in regards to your request. Looking for metal lockers? Check out Lyon’s full line of lockers.